In sports of all kinds, there&apos;s conventional wisdom that says that when two fierce rivals meet, you can "throw out the records." No matter how two athletes or teams may match up on paper, the rivalry itself is so powerful that it almost guarantees something competitive and dramatic will happen. 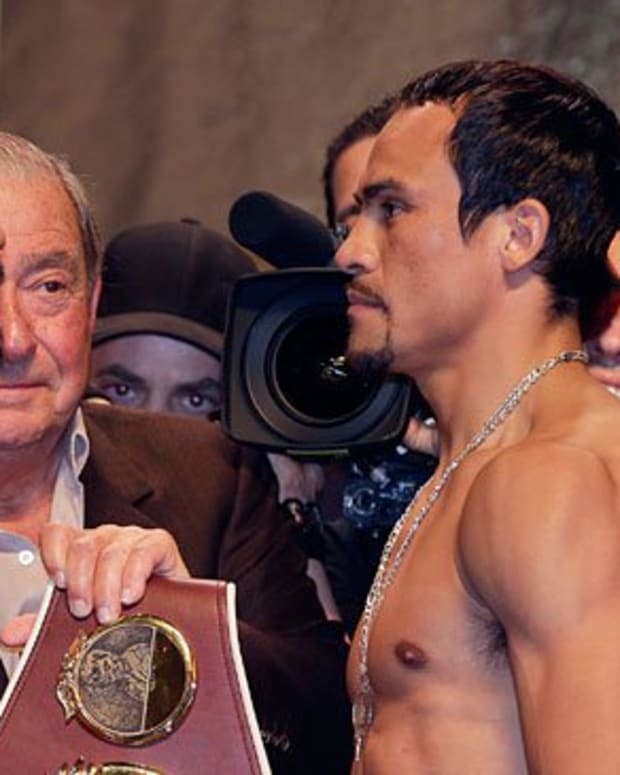 If that is indeed the case for Manny Pacquiao and Juan Manuel Marquez, their third meeting could live up to the narrow, highly debated outcomes of the first two fights. It&apos;s hard to remember two fighters in recent memory having equally strong reasons to want a decisive victory so badly. Marquez will have to hope that the same knowledge and guile that allowed him to win more individual rounds in the first two bouts can carry him again, because as brilliant as he is, he seems like the same boxer Pacquiao has already faced - just older and slower. No matter how he and his team talk up the weight training he&apos;s been doing, the 144-pound catchweight appears to favor his foe. In fact it&apos;s hard to get JMM&apos;s near total helplessness against Floyd Mayweather in his previous foray into welterweight territory out of my mind as I type this. In contrast, Pac-Man has evolved quite a bit over the past seven years. In 2004, Marquez only needed to worry about Manny coming directly at him looking for straight lefts. In 2008, he had to adjust to Pacquiao&apos;s improved footwork and defensive awareness, yet he could still count on a pretty straightforward attack. Now? Pacquiao has taken his offensive game to another level, displaying a killer right hook to go with his thunderous left. If JMM can stay off the mat and find just the right balance between counter-punching and surprising Pacquiao with jabs and lead rights, he has at least a chance to box his way to victory. The lightweight-plus version of him appears to have a bit more power than he had at lighter weights, so that may help too. The big problem is that watching the first two fights again, you realize how many flush shots Marquez took along the way. He hopped back up from them at 126 and 130 pounds. Can he at 144? I have my doubts. And as much as JMM craves this win, Pac-Man wants it too. It can&apos;t sit well with him that he went 1-0-1 and still has something to prove to some fans. He has more tools to make it happen, and I expect we&apos;ll see them all. One thing you can take to the bank is that Marquez will give absolutely everything he has, and he&apos;ll carry on the grand Mexican tradition of "going out on his shield" if it comes to that. It&apos;s admirable, for sure. I just don&apos;t think it will be enough. Look for Marquez to find Pacquiao version 3.0 too much to handle, and don&apos;t be surprised if Pac-Man has his hand raised after a mid-round TKO. Get more great boxing news recaps and analysis over at Boxing Watchers.